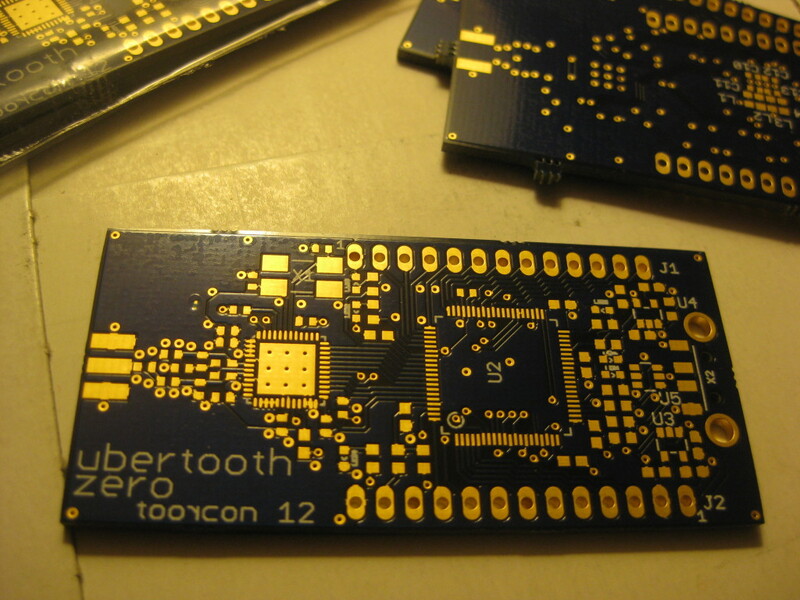 Last weekend at ToorCon 12 I unveiled Project Ubertooth, something I've been working on for more than a year. The goal of the project is to produce a low cost 2.4 GHz wireless development platform suitable for Bluetooth sniffing (among other things). If you are familiar with previous work on Bluetooth monitoring, then you know that good tools are expensive. Commercial equipment costs $10,000 or more, and even the open source solution requires a hardware investment of at least $1000. In my talk, Ubertooth Zero, a preview, I demonstrated Bluetooth sniffing for the first time with Ubertooth Zero, my first prototype hardware model. The platform is based on the Texas Instruments CC2400 wireless transceiver paired with NXP's LPC1758, an ARM microcontroller with USB. 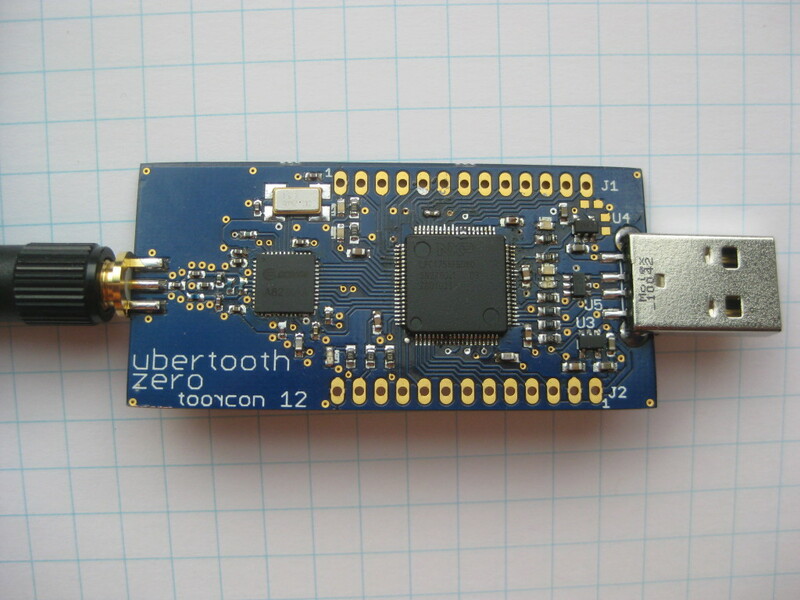 You can build an Ubertooth Zero for less than $50 in parts. The hardware design and host code are published in the svn repository at http://ubertooth.sourceforge.net/, and firmware will follow as soon as possible (probably a couple weeks). Everything is open source. 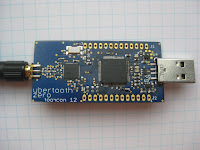 Over the coming weeks I'll be working on the next model, Ubertooth One, which I hope to have available in early 2011. It will be compatible with the Ubertooth Zero software but will have an improved RF front end, comparable to a Class 1 Bluetooth device. I hope to produce Ubertooth One commercially, making it available to those who don't want to solder 0402s, but rest assured that the product will remain fully open source. I'm also working on firmware, host software, and documentation so that the platform will be easier to build and use. I would love to hear from you if you decide to build an Ubertooth Zero. Keep in mind that this is a preview release with much work still undone. So far I've built three working boards, one of which fetched $275 in Sunday night's ToorCon Foundation auction, supporting technology education in developing countries. 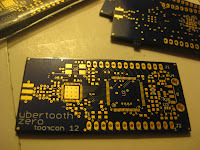 I have three more that I hope to get working soon, and then I'll start work on Ubertooth One. ToorCon was a blast, as always. Thanks to everyone who attended the Software Defined Radio Workshop, Real Men Carry Pink Pagers, and the Ubertooth talk. Thanks to Travis for making our talk so much fun. Thanks to Dominic for making the trip from London. Thanks to George, Tim, and David for putting on a great con and making me feel so welcome. Thanks to all the friends, both old and new. Thanks(?) to Nick et al. for embarrassing the hell out of me. Thanks to Laen for running the DorkbotPDX PCB service. Most of all, thanks to Jared Boone who couldn't be at ToorCon but who has supported my effort to develop Project Ubertooth more than anyone.